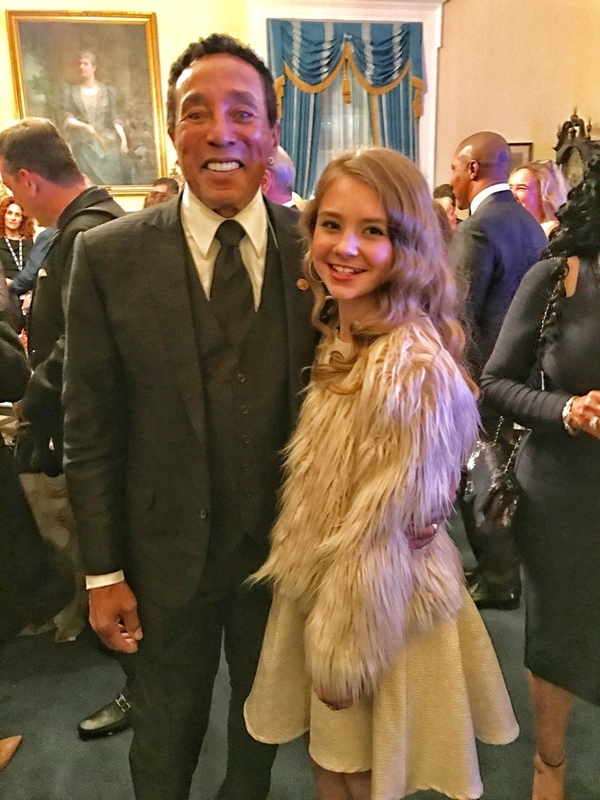 With a larger-than-life voice, 13-year-old country sensation Tegan Marie honored Smokey Robinson, the 2016 recipient of the Library of Congress Gershwin Prize for Popular Song, with a stunning performance of “My Guy” at DAR Constitution Hall in Washington, D.C., on Nov. 16. The “King of Motown” wrote and produced the 1964 chart-topping single recorded by Mary Wells. The evening aptly bridged genres from R&B, pop and classical to country, and highlighted how Robinson’s music spans generations from the baby boomers to Tegan’s coming-of-age Gen Zers. Samuel L. Jackson hosted the evening’s festivities that also featured appearances by the honoree Aloe Blacc, Gallant, Berry Gordy, CeeLo Green, JoJo, Ledisi, Kip Moore, Corinne Bailey Rae, Esperanza Spalding, The Tenors and BeBe Winans. The special will air on PBS nationwide at 9 p.m. ET on Feb. 10, 2017. Continuing her run of national appearances, Tegan will perform on Radio Disney Country’s float in Chicago’s Magnificent Mile Lights Festival Tree-Lighting Parade Nov. 19, airing live nationwide. A native of Flint, MI, the burgeoning singer-songwriter released her catchy single, “Lucky Me,” last spring with 100% of the proceeds going to children directly affected by the water crisis in her hometown. She stunned listeners this summer when she released her breathtaking rendition of Florida Georgia Line’s #1 smash hit “H.O.L.Y.,” which garnered 17 million plus views on Facebook and led to high-profile media looks including her national TV debut on ABC’s Good Morning America and US Weekly's “Buzzzz-o-Meter” feature. She also caught the attention of the U.S. Women’s Soccer Team who invited her to perform the national anthem at their last home game prior to the Olympics. After debuting on the Radio Disney Country stage at the CMA Music Fest in June, Tegan has played shows with country stars Hunter Hayes, Thomas Rhett, Cam and Chris Stapleton.